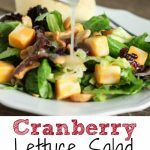 This Cranberry Lettuce Salad is the perfect salad for your family Thanksgiving or Christmas but easy enough for a weeknight meal. This recipe comes from one of my favorite cookbooks. A fundraiser cookbook put together by fellow dairy farmers in the state. It never fails, whenever we have a big fall or winter holiday meal we always decide we need a salad last minute. Our family loves this Strawberry Bacon Spinach Salad but we think of it as a spring and summer salad so it doesn’t fit the bill come harvest. We also don’t want just ANY salad we want a salad fit to be on our thanksgiving table. Well I have finally solved this problem! This Cranberry Lettuce Salad is fancy enough for our holiday meals but simple enough to toss together quickly. 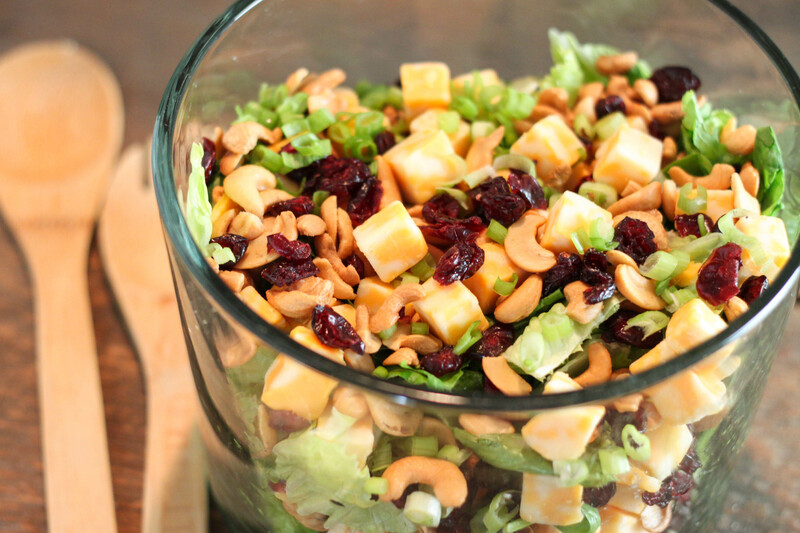 This Cranberry Lettuce Salad would be the perfect healthy side to bring to a holiday pitch in. 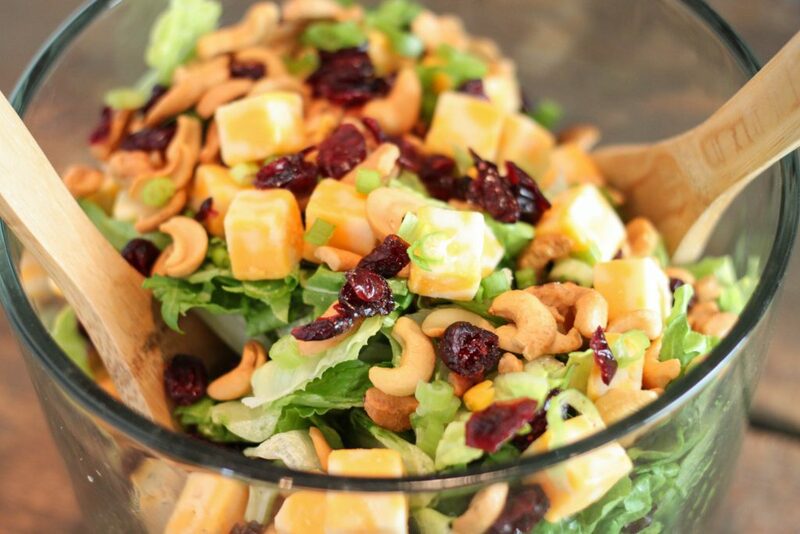 This salad is easy to put together. Add your lettuce (you can use any kind you like – I am going to try spinach and spring mix next time I make it) to a salad bowl. Toss the remaining ingredients on top. Whip up the dressing, using a small food processor makes this go a lot quicker but you can use a whisk if you don’t have one. 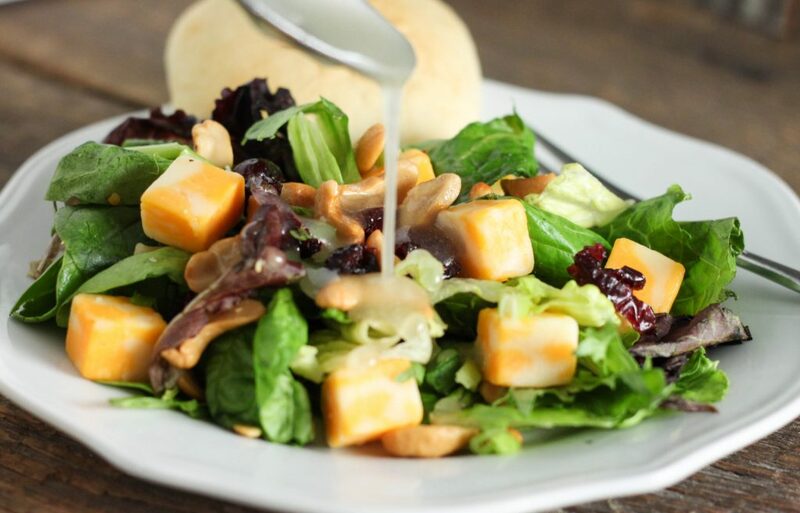 I like to serve the dressing on the side because I am not a big dressing fan but you could toss the salad in the dressing before serving if you like. Mix all salad ingredients together in a large salad bowl. Combing dressing ingredients together and whisk together until well incorporated.